El Pallars Sobirà spreads from south to north, from a narrow pass named Congost de Collegats to the village of Alòs d’Isil, following the course of the river Noguera Pallaresa. Traditionally, it had always been a county mainly dedicated to subsistence farming and animal breeding, the use of forest resources, the mining exploitation, the salt works in Gerri de la Sal and the establishment of the hydroelectric power industry. From a few decades ago, the primary sector has lost some of its previous importance and the third sector has increased, basically thanks to tourism. Its main tourist attractions are the historic heritage, the majestic beauty of its landscapes and the popularity of outdoor activities and sports. 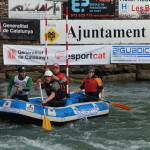 It was precisely in Pallars Sobirà, in Catalonia, where the rising industry of adventure sports as a business started. 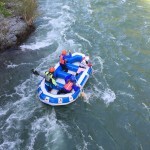 The river Noguera Pallaresa witnessed the first raft boat in the 60s, by a group of French people. It was during the 80s that the first business to offer this kind of activity was created. Nowadays, there are many more trades that have specialized in adventure sports. 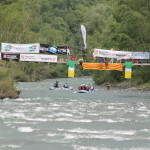 Thanks to some of its most relevant features, it is considered to be one of the best rivers in Europe for this sport. Private trades basically offer to run down the section starting in Llavorsí to Collegats, with its busiest section between the towns of Rialp and Sort. 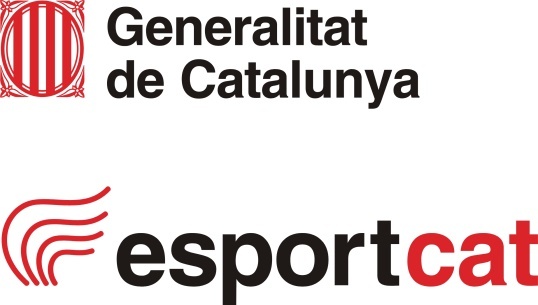 Rialp: extension of 63.31 km (Rialp, Surp, Beraní, Caregue, Escàs, Rodés and Roní), 534 inhabitants, main economic growth: tourism. 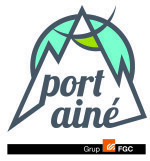 Sort: extension of municipal area 105.07 km (with 15 villages), 2,227 inhabitants, main economic growth: tourism. Capital town of the district. 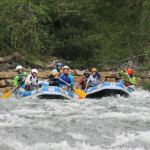 El Pallars Sobirà and its river, La Noguera Pallaresa, are one of the best venues in Europe for activities such as kayaking and rafting. 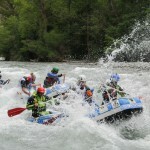 Rafting is, in fact, one of the main drives for economy growth in the whole area. There is quite a long history of kayaking and canoeing competitions, but there has never been a very important rafting competition. For this reason, we think that El Pallars Sobirà, and specially the towns of Rialp and Sort, are the perfect settings for a competition of this kind.